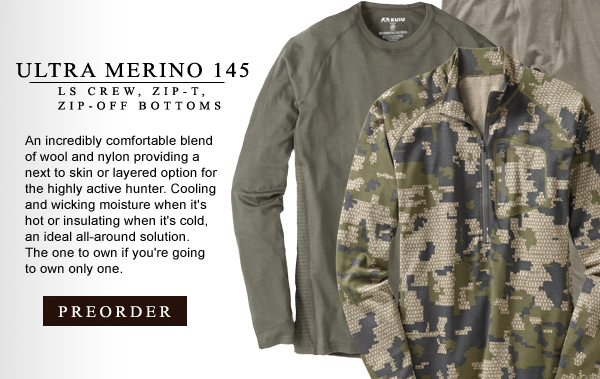 DIXON, CALIFORNIA (May 22, 2014) – KUIU has developed a new Merino Wool base layer collection featuring Nuyarn technology. 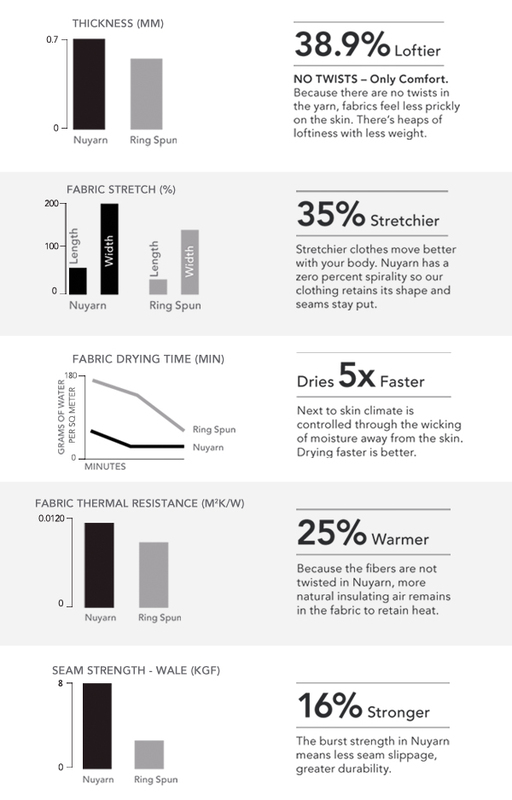 This technology has allowed the ULTRA Merino base layer line to be itch free, faster drying, loftier, stretchier, warmer, stronger, and lighter than any comparable Merino product in the industry. In addition to an enhanced fabric, the ULTRA Merino base layer line consists of enhanced design features that have improved functionality, fit and increased comfort. 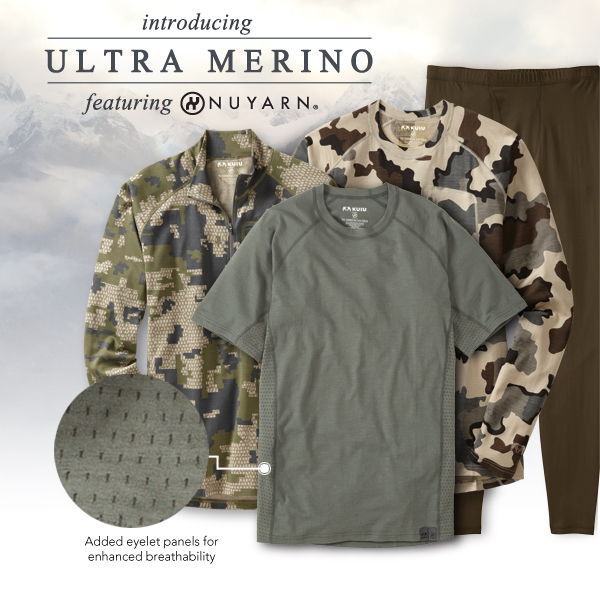 The Merino Company’s Nuyarn has enabled KUIU to reinvent their merino base layer collection. Nuyarn is an entirely new way of making fabric. Traditional spun yarn twists fibers together for strength, which leaves ends poking out. The Merino Company’s Nuyarn takes the twist out, and instead lays fabrics along the same orientation as the rest of the yarn, so fabrics feel less prickly, more comfortable and fabrics become stronger. Nuyarn lower-density fabrics mean a lighter weight garment can out-perform a heavier one made of traditionally spun yarn. These properties make Nuyarn ideal for a wide array of ULTRA Merino products. Nuyarn rights all the wrongs of traditional merino fabrics while maintaining all the natural benefits of wool. Improved design features of the ULTRA Merino line include Zip-Off base layer bottoms (first ever introduced to the market) and Eyelet side panels in our tops. The zip off bottoms allow for easy on and off without removing your boots and the eyelet side panels were included for enhanced ventilation, expand and contract with movement, regulate airflow, and maximize breathability. KUIU’s ULTRA Merino collection consists of three fabric weights. The ULTRA Merino 125 collection includes a SS Crew-T and LS Crew-T. The ULTRA Merino 145 collection includes a LS Crew-T, LS Zip-T, Zip-Off Bottoms, Beanie, and a Neck Gaiter. The ULTRA Merino 210 collection includes a LS Zip-T, Zip-Off Bottoms, and a Glove. All are available in various styles and color options including both solids and camouflage. Nuyarn has been independently tested by the IANZ accredited Textile Testing Laboratory at AgResearch. These results have proven Nuyarn®’s superior performance as compared to traditional ring spun yarn. Test result documentation is available on KUIU’s website.